The Klaxxi is a council of Mantid elders whose role is to keep the Mantid empress in check and ensure the transfer of power from one empress to the next. The current Mantid empress, Shek'zeer, has fallen under the influence of the Sha and has ordered an early swarm, overusing the various Mantid resources (food, amber, etc.) to keep her prematurely hatched army alive. The Klaxxi are determined to put an end to the Empress' madness and to do so, they require the help of Alliance and Horde players alike. After reaching level 90, and finishing the Mantid storyline in the Dread Wastes, you will be able to start doing the daily quests at Klaxi'vess. Every day, you will be given a number of daily quests at Klaxxi'vess in the Dread Wastes. The exact number of quests will depend on your current standing with the Klaxxi. As your reputation increases, you will be asked to free new Klaxxi Paragons. These new Paragons will then start offering you daily quests. The Klaxxi Paragons will also offer to apply powerful buffs on you before you start your daily quests. There are four questing locations for the Klaxxi. The first questing location is a zone that comprises both the Terrace of Gurthan and the Forgotten Mire. The second questing location is at the Lake of Stars. The third location is in Zan'vess. The fourth location is at the Clutches of Shek'zeer, right in front of the Heart of Fear entrance. You will receive between 1,040 and 1,170 reputation every day (depending on the questing location of the day), so it will take about 3 weeks to reach exalted reputation with the Klaxxi. It will take less if you are a Human or if your guild has unlocked the +10% reputation perk. You can earn another 400 reputation a day by doing the Klaxxi Work Order at your farm (see our Tillers guide). As soon as you reach revered reputation with the Klaxxi, make sure to purchase the Grand Commendation of the Klaxxi from the faction quartermaster. Using this item will allow you to reach exalted reputation much faster. In order to increase your reputation gains with the Klaxxi, you can choose to champion them in the reputation tab of your character panel. This will cause you to gain addition reputation when doing various activities, but mostly through running Heroic dungeons and scenarios. 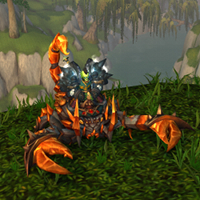 The Klaxxi will reward you with a tabard, a mount, profession patterns, and many pieces of gear. All the rewards can be bought from Ambersmith Zikk at Klaxxi'vess. 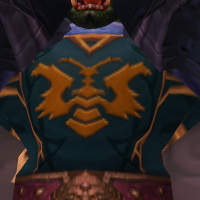 After reaching exalted reputation, you can buy the Klaxxi Tabard, which costs 10 . 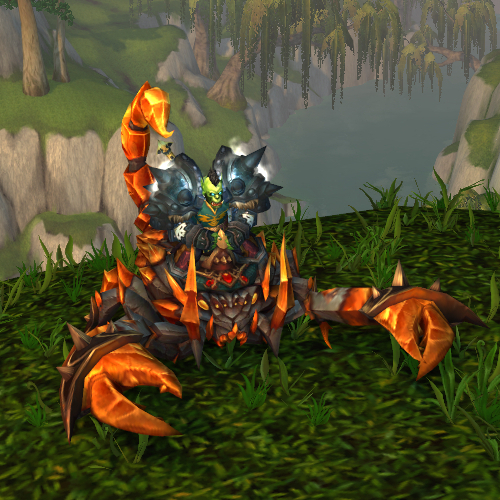 After reaching exalted reputation, you can buy the Reins of the Amber Scorpion for 7,500 . After completing the Klaxxi quest line and obtaining the Dread Haste Makes Dread Waste achievement, you will have recovered 4 of the Klaxxi Paragons: Kil'ruk the Wind-Reaver, Malik the Unscathed, Korven the Prime, Kaz'tik the Manipulator. Rik'kal the Dissector, by going to Zan'vess to complete the The Zan'thik Dig quest given to you by Kor'ik at Klaxxi'vess. Xaril the Poisoned Mind, by completing Beneath The Heart Of Fear, which is given to you by Kil'ruk the Wind-Reaver at Klaxi'vess when you reach revered reputation. At about 10,000 honored, we received the Overthrone quest, which explains a bit of lore regarding the Mantid, the Klaxxi, and the Heart of Fear raid. We have heard conflicting reports regarding when exactly this quest becomes available, so it may not be exactly 10,000 honored reputation. Every day, you will be able to choose two buffs to help you with your daily quests. If you do not make a choice, then your last choices (from a previous day) will be kept. The first buff is called an Augmentation and you will have the choice between 5 Augmentations, each given by a different Klaxxi Paragon. The second buff is called an Enhancement and you will have the choice between 5 Enhancements, each given by a different Klaxxi Paragon. There are 10 Klaxxi Paragon, so each of them will offer you either an Augmentation or an Enhancement, as described in the table below. Skeer the Bloodseeker Battle Hymn Augmentation Heals you for 1% of your health every second for 10 seconds after a kill. Kaz'tik the Manipulator Master of Puppets Augmentation Allows you to mind-control enemies and make them fight for you. Korven the Prime Painkiller Augmentation Painkiller will save you from a deadly blow and heal you back to full health. It cannot occur more often that once every 3 minutes. Ka'roz the Locust Speed King Augmentation Stacks a movement speed increase buff on you each time you kill a creature. Kil'ruk the Wind-Reaver Angel of Death Enhancement Once per minute, Kil'rul will assist you if you gather at least 2 enemies within 10 yards. Rik'kal the Dissector Children of the Grave Enhancement Causes corpses to damage nearby enemies. Malik the Unscathed* Iron Mantid Enhancement Mitigated attacks made against you cause you to deal damage to nearby enemies and stun them through Bladeturning. Xaril the Poisoned Mind Raining Blood Enhancement Each attack stacks Unstable Serum on your enemy. At 8 stacks, the poison deals heavy damage and stuns nearby enemies. *Note that after completing the final quest chain, Malik the Unscathed will no longer be available in Klaxxi'vess. In order to get this buff ( Iron Mantid), you will need to interact, in Klaxi'vess, with an object called Halberd of the Unscathed. Not all Augmentations and Enhancements are useful. Here is the list of those that you are likely to use. Painkiller (Augmentation) is great for cheating death and can be useful if you often die and cannot benefit from a similar class-specific ability (such as Cauterize for Mages or Cheat Death for Rogues). Speed King (Augmentation) gives a very useful movement speed increase. Iron Mantid (Enhancement) is useful for melee classes who want to engage a lot of enemies at the same time. Raining Blood (Enhancement) is perfect for classes that can attack at a very fast pace, such as Rogues or Enhancement Shamans, because all of their attacks will add a stack of Unstable Serum. Also, channeled spells like Blizzard or Arcane Missiles from Mages, or Rain of Fire from Warlocks will work very well with this buff. Finally, classes that have particular abilities with a very low Global Cooldown can use them to rapidly build up stacks of Unstable Serum. Every day, you will be sent questing in one of four possible locations. None of the quests is difficult enough to warrant a specific explanation. Simply read the quest details carefully. *Hisek the Swarmkeeper is unlocked when you reached revered reputation. Warlord Gurthan will appear and you need to defeat him. Ashes of Warlord Gurthan starts The Warlord's Ashes, which you can turn in to Ambersmith Zikk at Klaxi'vess for 130 reputation. There is no drop quest at this location. During your daily quests at Zan'vess, you can loot a Massive Kyparite Core from Kypa'rak, a very large worm who is found at the Briny Much, next to Zan'vess. This item starts Kypa'rak's Core, which you can turn in to Ambersmith Zikk at Klaxi'vess for 130 reputation. During your daily quests at the Clutches of Shek'zeer, you can loot Enormous Kunchong Mandibles from Karanosh, a large Kunchong who is found near the entrance of the Heart of Fear. This item starts The Matriarch's Maw, which you can turn in to Ambersmith Zikk at Klaxi'vess for 130 reputation. Every day, you will also be given Rampage Against the Machine by Kaz'tik the Manipulator in Klaxxi'vess. This quest requires you to use Kovok (who is waiting for you outside of Klaxxi'vess, on your way down to the Scar) to kill 200 Mantid. After reaching revered with the Klaxxi, you will sometimes receive Dark Skies, given by Xaril the Poisoned Mind, instead of the usual Rampage Against the Machine. Seeds of Fear is a repeatable side quest that you can use to earn reputation with the Klaxxi. To complete it, you need to collect 20 Dread Amber Shards, which have a very low chance to drop from any mob in the Dread Wastes, and turn them in to Ambersmith Zikk at Klaxxi'vess. Each turn-in will reward you with 250 reputation with the Klaxxi. Note that farming and turning in Dread Amber Shards is mostly a waste of time and is much less efficient than simply doing the daily quests. Only turn in the shards that you collect during the daily quests, but do not bother killing mobs specifically for the purpose of farming them. By the time you reach exalted reputation with the Klaxxi, you should have earned Klaxxi, Amber is the Color of My Energy, and Test Drive (from completing Rampage Against the Machine for the first time). It means that you should only have Over Their Heads and Stay Klaxxi left to complete. To complete Stay Klaxxi, you need to complete at least 5 Klaxxi daily quests with each of the 5 Augmentations and each of the 5 Enhancements. Note that only the buffs you have when turning in the daily quests matter. This means that you can do the daily quests with your preferred Augmentation and your preferred Enhancement, and only change them (for the purpose of complete the achievement objectives) when you come back to Klaxxi'vess to turn in the quests. Over Their Heads can only be completed during the Dark Skies quest. To complete the various objectives of the achievement, you need to find a number of NPCs and drop a bomb on them. Only 3 NPCs will appear each day. Since the quest is rare to come by, you can simply leave it unfinished in your quest log and try to do it every day (to check for NPCs that you are still missing). Note that Xaril the Poisoned Mind will only let you fly if you do not complete the quest objectives. This means that if you somehow complete the quest objectives, you will have to abandon the quest and possibly not get it again before many days. For the actual position of the NPCs, we refer you to a post from Karadine on Wowhead.